This video shows you have to make the language plant at the bottom of the page, how to bend and twist and shape and place words. I’ll have a go at that! The following lesson may or may not have happened. You do? Are you good? Good. What else can you play? Not a sport. Something else. Ahh! I play the guitar. OK, next lesson, no English, we make music! What else can you play? 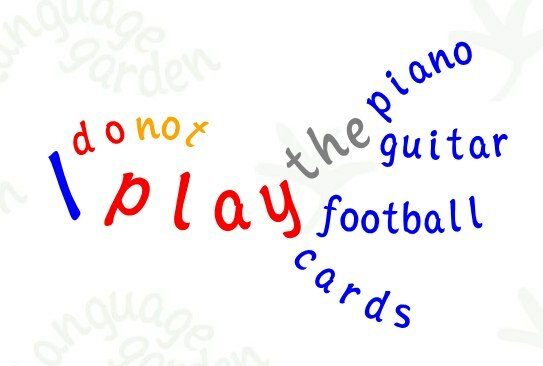 You can play a sport – football, a musical instrument – piano, and … a game. I play chess. Really? I don’t play cards. I don’t play backgammon. No, I don’t play cards. I don’t play the guitar. I don’t play tennis. OK, I’ll have a go. It seems easy enough. You are currently reading Playing with “play” at language garden.